I've only ever met a wild pig once, and it was on the run. It was in a rainforest park in North Queensland, where pigs were reportable animals. I came round a corner on a trail, and there it was, a little black and white creature, rooting around happily. It looked up, saw me, and ran for its life. The pigs locked in metal stalls are prisoners with no chance of running. Some of them cannot even turn round. Many never see the light of day before they die miserable deaths. The activists who fight for animal rights and the activists who fight to save our forests must be the bravest people in the world. The animal rights activists don't shy away from what has become allowable, hidden away from ordinary shoppers. A pig's life can be very happy, or very very sad. It doesn't take much to make it a great deal happier, but while our politicians don't care how much other creatures suffer, then most farmers will figure that they have to be cruel to 'compete'. The retail food industry leaves no margin for happiness for pigs. I have visited a farm where the pigs had wallows and interacted together, as families, so I know that it is possible. Let's try to make it easier for farmers and for the rest of us who want to be kinder. 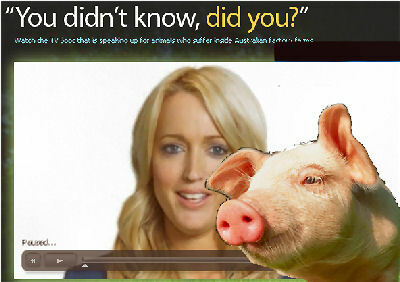 The embedded film in the teaser and here is the first televised ad that Animals Australia has run. "The shocked look on her face says it all. This shopper has just seen for the first time the miserable lives endured by mother pigs in factory farms. Like most Australian consumers she had no idea that the pork, bacon and ham that she had been purchasing for years had come from factory farms – and were the products of cruelty. Most Australians are appalled by animal cruelty, but are totally unaware that their shopping habits are supporting one of the cruellest industries on Earth. Animals Australia's new campaign will alert the community to their power to end the suffering of animals in factory farms, and that what they buy, or choose not to buy, sends a crucial message to these cruel industries. With your help, this powerful television commercial can air in homes across Australia reaching millions of people with the truth, calling on them to vote against animal cruelty at the supermarket. Even if you've never donated before, please make this rare opportunity to help factory-farmed animals the reason to start. On behalf of all animals thank you for your support. P.S. And don't forget to order your free action pack!" What is clearly "legal" is not necessarily moral, ethical or sustainable. Already we have faced swine flu, initiated by the inhumane cruelty and unnatural crowding of pigs in small confined spaces. The massive cruelty of confining sows in metal crates for up to 4 month and then not allowing them to interact with their young in incomprehensible. The suffering of these intelligent and sensitive social animals must be intolerable. Piglets are allowed, "legally", to be de-teethed and de-tailed without pain relief. Male piglets are castrated without anesthetics. The farmers are protected from RSPCA prosecution because of the Codes of Practice, really codes of cruelty that protect the producers, not the animals! How do these practitioners ignore the screams of the writhing pigs if they are mutilated while fully conscious? How do the vets allow this? Profits are the bottom-line in our livestock industries, and they rely on public ignorance, and callousness. The standards of "free range" are flexible and are manipulated. The best way to avoid this cruelty to pigs is to not buy into it. Already we have faced the threat of swine flu, initiated by the inhumane cruelty and unnatural crowding of pigs in small confined spaces. Factory farming means the massive cruelty of confining sows in metal crates for up to 4 months and then not allowing them to interact with their young is incomprehensible. The suffering of these intelligent and sensitive social animals must be enormous. Piglets are allowed, "legally", to be de-teethed and de-tailed without pain relief. Male piglets can be castrated without anesthetics. This treatment would cause an outcry if it was allowed on companion animals! Producers are protected from RSPCA prosecution because of the Codes of Practice, codes that permit cruelty. How do these practitioners ignore the screams of the writhing pigs if they are mutilated while fully conscious? How do the vets allow this? Profits are the bottom-line in our livestock industries, and they rely on public ignorance and callousness. Let's hope the pork industry is squirming uncomfortably from the exposure of piggeries! What is clearly "legal" is not necessarily moral, ethical or sustainable. The best way to avoid this cruelty to pigs is not through the self-regulating industry, evidently, but for the public not to buy into it.